HomeAbout UsKso NewsAlice WonderlandDisney in Concert – Alice in Wonderland: Kalamazoo Symphony Orchestra Lands US National Premiere! Disney in Concert – Alice in Wonderland: Kalamazoo Symphony Orchestra Lands US National Premiere! Kalamazoo, MI November 19, 2015 – The Kalamazoo Symphony Orchestra is excited to announce that, following performances of Disney in Concert - Alice in Wonderland at the London’s Royal Albert Hall with the Royal Philharmonic Orchestra (December, 2015), the project moves on to Kalamazoo in April 2016 for its US premiere! 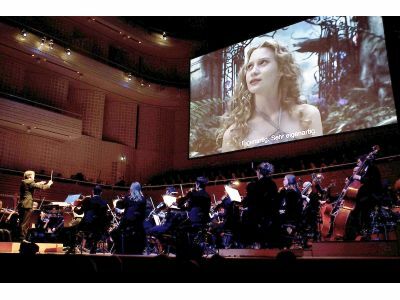 This brand new orchestral concert event features Tim Burton's blockbuster film projected on the big screen while live symphony orchestra and choir bring Danny Elfman's lush musical score to life. The much-anticipated concert in the KSO’s Special Events series. To kick off a three-year exclusive partnership with Disney, the KSO presents KSO@The Movies with Disney in Concert -Alice in Wonderland conducted by Maestro Raymond Harvey and features the Kalamazoo Singers and the Kalamazoo Children’s Chorus. This full length film with original voice and sound effects will play on the big screen while your KSO musicians bring Danny Elfman’s amazing and breath-taking score to life.